Here is a interesting picture with two arrangements of four shapes. How can they make a different area with the same shapes? This is a famous physical puzzle that can be tied to the fibonacci series. To answer the question as posed, the issue is that the two slopes are different ($\frac25$ vs $\frac38$). Note that all those numbers are in the fibonacci series ($1,1,2,3,5,8,13,21,\ldots$). 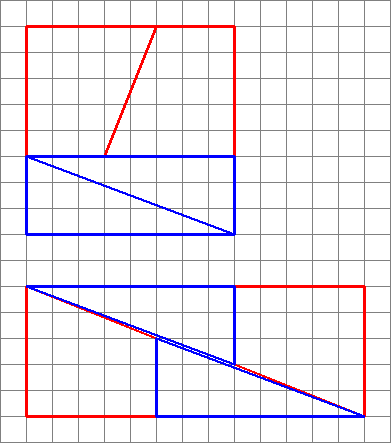 Successive fractions are closer approximations to $\varphi$, alternating between above and below. 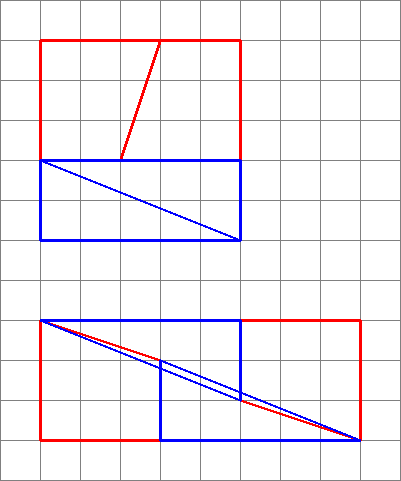 Diagrams like this can be generated by making a square with sides equal to a number in the fibonacci series (in this question 8), then dividing it into two rectangles with widths of the two fibonacci numbers that make up the first one chosen (3 and 5). 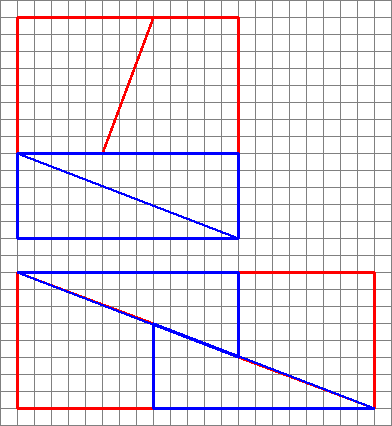 Cut the smaller one down the diagonal, and cut the bigger one down the middle at a diagonal, such that the width of the diagonal cut is the next smallest number (2 in this case). 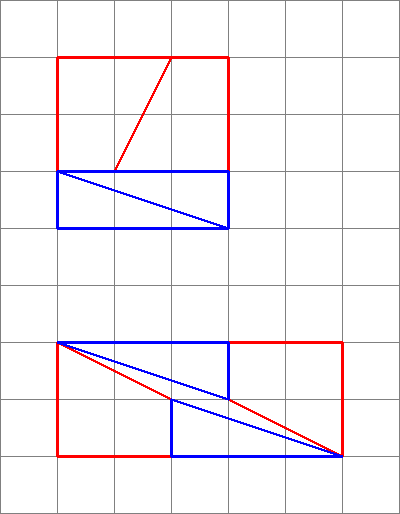 Note that this will leave a trapezoid, whose small parallel size matches the original small rectangle's smaller side (3 in this case), and whose larger parallel size matches the original larger rectangle's smaller side (5 in this case). 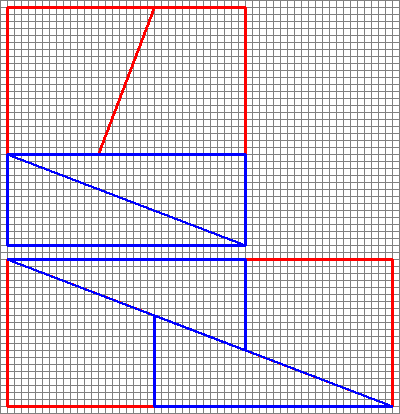 Since $\frac25\approx\frac38$, and from the above constructions, the pieces can be rearranged into a rectangle (as shown), the area of which will always be one away from the original square, but will look approximately correct, since the slopes almost match. Edit: Since this answer received so many up-votes (thank you! ), I suppose people are very interested in it, so I thought I'd draw up a few images! The diagram is misleading, as it hides a gap in the middle of the second configuration. This is what we actually get if we rearrange the shapes in question. Notice that the diagonal “bows” slightly, leaving some extra space between the shapes – this is where the extra unit of area creeps in. But you shouldn’t trust me any more than the person who drew the original picture! As we see here, pictures can be misleading – so my diagram isn’t proof that the original diagram was wrong. This just gives an intuitive sense of where the extra space has come from. Since the gradients don’t match, we can’t arrange them side-by-side like this without some blank space between them. But because they’re close, the eye can be tricked into thinking they form a single continuous line, and doesn’t notice the slope on the triangle changing midway down. Substituting the values into the formula gives exactly 0.5 for $A$. There are two such triangles, so that's a total 1 = the expected discrepancy. It's a misleading diagram. In reality, the angles do not match up- the larger interior angle of the orange triangle is about 69.5 degrees, whereas it's 68.2 for the grey quadrilateral. (Correct me if I'm wrong- dusting off my trig here.) In the diagram with area 65, the orange areas are actually quadrilaterals. If you look closely, you can see that they have a slight inflection where they meet the other orange section. So that extra area comes from expanding them just a bit. 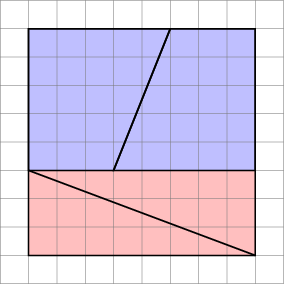 The triangles don't have the same slope; you can see that the large diagonal line through the "larger" rectangle bends. It's covered up by the thick lines around the triangles, but there is a very thin hole that has a total area of one square - the same square that supposedly "appeared out of nowhere". Just enlarge the image and you'll see the answer. Those shapes (in orange) at the right side of picture, are not triangles at all! they are two quadrilaterals. an thus they have area greater than visually expected. so there is no equity here. 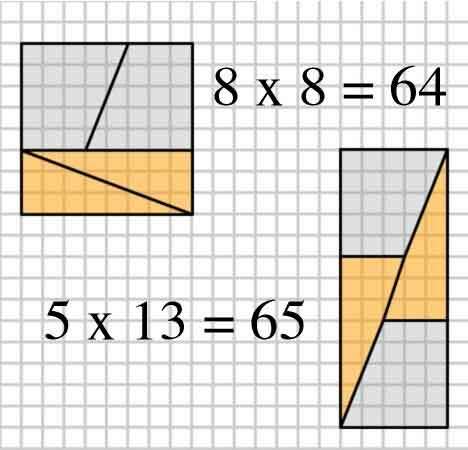 They are different and thus have different total area. The picture of the bottom rectangle is misleading, because it fools people into incorrectly assuming the width of the triangles to be exactly 3 units. The real width can be easily calculated - it's a fraction of the total width, defined by the height of the point on the diagonal, or at exactly 8/13th of 5, ie. 3.076923077 (and not 3), q.e.d. Not the answer you're looking for? Browse other questions tagged mathematics calculation-puzzle geometry lateral-thinking or ask your own question.